The year is 1907, the setting is Baker Street, London. When the Martian Ambassador arrives at Holmes’ door seeking the Great Detective’s help in solving a grisly murder, how can he refuse? The case will involve a trip to the Red Planet, where few humans have been privileged enough to visit. Ever since the second wave of Martians arrived on Earth, inoculated against the germs that had halted their tripods the first time around, and humanity accepted the aliens as their overlords, Holmes has been curious... Soon he and Watson are boarding one of the great Martian spaceships, where they discover their old friend Professor Challenger has been invited along for the ride. What awaits them at their destination is a plot more dastardly than any of them could have imagined. 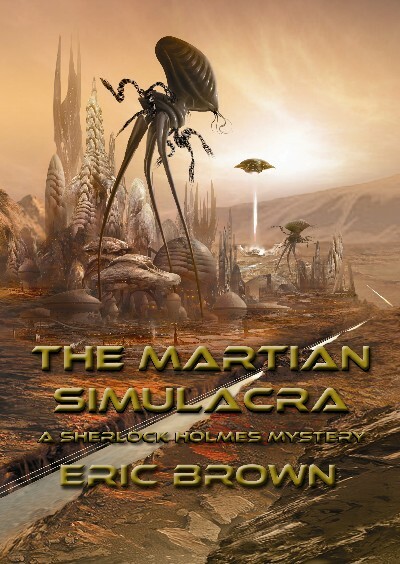 In The Martian Simulacra, award-winning author Eric Brown delivers a glorious mash-up of Sherlock Holmes and The War of the Worlds, seasoned with a dash of Conan Doyle’s The Lost World for good measure.